The Chip Bee area around Holland Village is a very nice place to spend a morning or an afternoon. You won’t be able to spot Chip Bee if you’re standing on exciting Holland Village side (it is blocked by 1 building), which is why Chip Bee has a laid back and lazy feel to the area. I like coming to Chip Bee/Holland Village once in a while to look at the shops. When I was living in Holland Village, I loved strolling past all the 2 storey old houses that are also part of the Chip Bee area. There aren’t many shops at Chip Bee, but each of these shops holds enough interesting things that I can spend almost half an hour in the shop browsing through their wares. The 1st stop is Pantry Magic. When I first saw their website with pictures of their shops, I knew at once I had to go there. 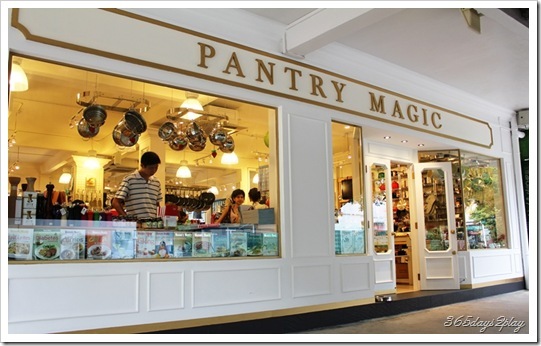 Pantry Magic is like a dream come true for all baking and cooking enthusiasts. It houses so many different types of pots and pans, of every colour you would want. Ordinary things like forks, spoons, knives and chopsticks look so nicely designed that you feel that you just have to have them or your kitchen would not be complete. And then there’s the cupcake holders made of silicone. They have funny faces on them. Who wants to buy silly old normal paper cupcake holders after this? They also have baking moulds, serving dishes, jugs, plates, bowls. They even sell barbecue grills, ice-cream makers and food-processors. 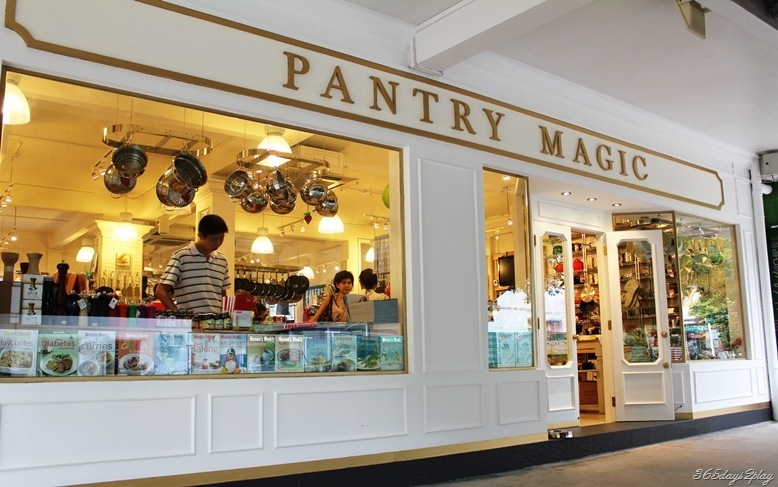 If you intend to go to Pantry Magic, be prepared to bring lots of money. The things don’t come cheap, not everything is worth the price-tag, and you could probably find cheaper generic (ugly) versions at NTUC or Phoon Huat. But what’s the fun of going to Pantry Magic if you’re going to emerge empty handed? Trust me, any cooking enthusiast young or old will not be able to resist. I wish Singapore had more of such cookware shops. I really could do with a bigger variety like the cavernous warehouse sized kitchen stores they have in the US. « Let the World Cup begin! This place is super gorgeous!! its seems to stock high quality stuff like Williams and Sonoma. I remember chip bee gardens in the mid 80s…there was a fabulous place that sold the best fried rice and fried bee hoon…but my memory is hazy about the name. I have no idea how Chip Bee was like previously. Was it a row of local eateries and shops?? I think in 20 years time, those who know how to cook delicious local dishes will be millionaires. It’s still a bit hazy in my memory but it was a pub like cosy restaurant called Chip Bee Gardens something or other. My aunt used to bring me there when i was a kid.